Knowing which stocks to buy and sell is tough, which is why many experts suggest most investors instead build a portfolio of low-cost index funds made up of ETFs, or exchange traded funds. But even then, how do you know which fund to choose? Should you go with Vanguard, Schwab, Fidelity, Blackrock, or another investment firm? If you don’t know the difference between the S&P 500 and Russell 2000, how do you choose between the two? That’s where Stash comes in. Stash is a low-fee investment platform designed for newer investors looking to get started and experienced investors looking for a new, simple platform to build and manage an ETF portfolio. Continue on through this Stash investing review to learn more about what it costs, how it works, and if it makes sense for you. While the company is officially called Stash, the website is at StashInvest.com, so many people refer to the company as Stash Invest. We may use the two terms interchangeably in this Stash Invest review. Getting started with Stash takes about two minutes. 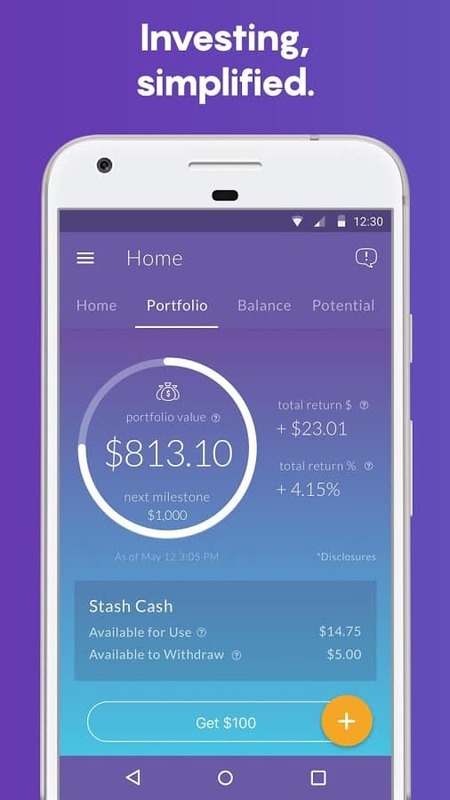 Be aware that even if you sign up on the Stash website, managing your account is best with the Stash Invest Android app or Stash Invest iOS app. This is a technology first investment platform designed for people who can manage their own investments using an app on their phone. If you are not comfortable with this type of technology or do not own a smartphone, Stash is not for you. 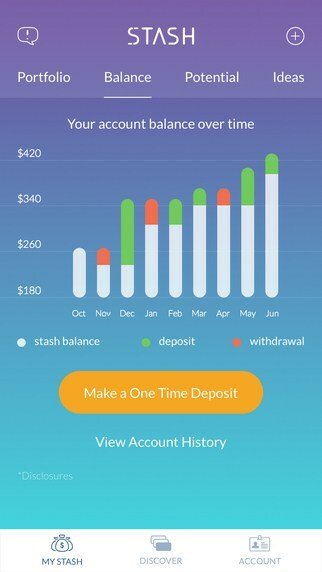 However, if you look to your phone or computer first when managing your money or looking to learn something new, Stash is a perfect fit. You can get started with just $5. The Stash app is the core of your Stash experience. 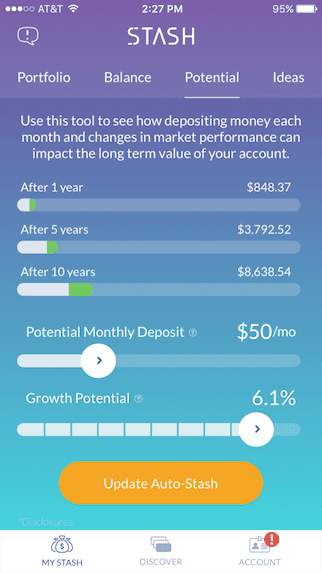 Users can use the app to add funds to their account, do research, learn about investment options, buy and sell ETFs, monitor your account, and manage your account. If you are a new investor, learn more about the benefits of ETFs and index funds here. The app offers easy navigation and a fairly straightforward user experience. Stash is not a roboadvisor like Betterment and some other competitors. Rather than manage the funds for you, Stash gives you the tools to pick and choose your own combination of ETFs. The app makes that experience quite easy. The app’s Learn section is focused on news and investment advice to help you make the best investment decisions possible. While it is not everything you need to know to invest, it does give you a lot of good information and is a great resource to get you started. Stash also curates and pushes relevant content based on your portfolio - this level of customization results in the education section being one of the best benefits of a Stash account. Of course, you can get much of the same information here for free at InvestmentZen, no account required! You can transfer funds into your account with the app using a one-time transfer or activate the recurring feature to “Auto-Stash” and add funds to your account on a regular basis. 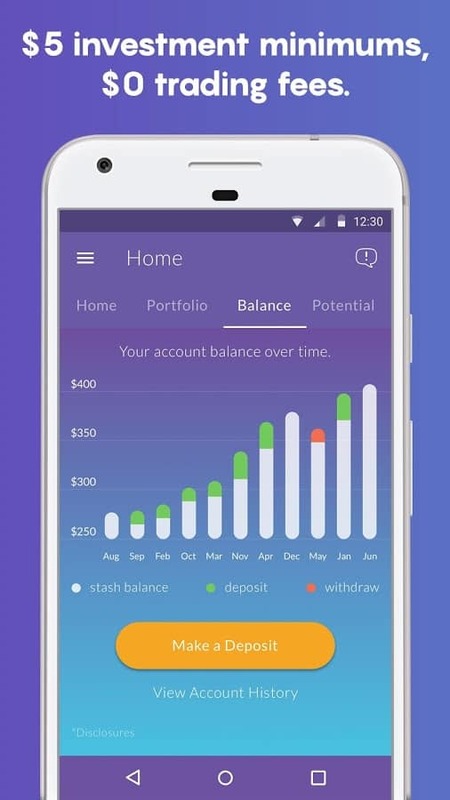 Except for the recently launched Stash Retire feature which provides a Roth IRA account to Android users with slightly different pricing and a limited amount of connected banks (iOS coming soon! ), Stash does not offer tax advantaged retirement accounts, so keep in mind that 100% of your capital gains are taxable in the standard account, unlike a 401(k) or IRA. Additional screens give you the numbers and graphical breakdowns on your portfolio, your total account balance over time, and additional useful information about your investments. Overall, the app is great! Stash offers simple pricing that makes sense for accounts you plan to add to regularly. The basic fee is $1 per month on all accounts with a balance below $5,000 and 0.25% per year for accounts with a balance of $5,000 and above. For a $5,000 account, that is $12.50 per year in account management fees. While there are some free accounts out there, this pricing falls in line with several popular robo advisor and investment management apps and platforms. There are no add-on trading fees or commissions with Stash, but the ETFs in your Stash account do charge fees (which is standard for all brokerages). The fees range from a very competitive 0.07% up to a less exciting 0.95% depending on the fund you choose. Remember to add this fee to your Stash fee to calculate the total cost of investing in your Stash account. Stash offers a selection of 35 ETFs to choose from. While each ETF is provided by a major fund family, like Vanguard, BlackRock’s iShares, and State Street’s SPDR, each fund is given a new name by Stash to easily identify what the fund is all about. For example, the Vanguard Small-Cap ETF is referred to as Small and Mighty in Stash. The funds are searchable by category. You can browse the I Believe, I Want, and I Like categories to pick and choose your favorite ETFs to align with your values or investment goals. 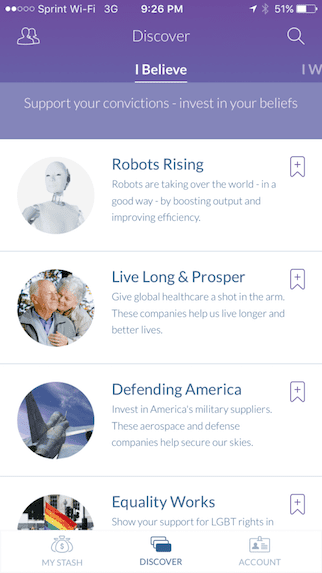 The "I Believe" section, for example, includes portfolios of renewable energy investments or companies that have a progressive, equal rights workplace and employment policy in place. While it is all nice and good to invest in companies you can believe in, remember that your investment portfolio will move up and down based on company profits and performance, not warm fuzzies and positive vibes. 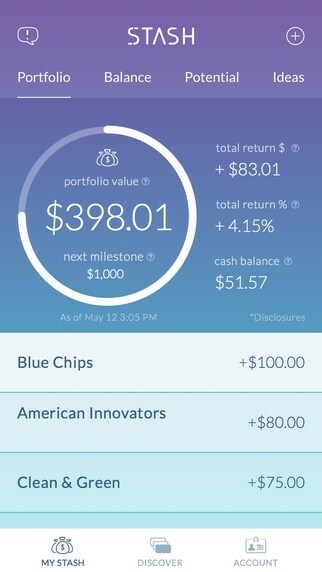 Each investment’s page on the Stash app gives you important details including a summary of how the fund works, a risk rating for the fund, and a list of investments held by the fund. Make sure to note the expense ratio, as you don’t want to accidently invest in high-fee funds just to see your investment gain get eaten up by fees! Overall, the array of funds here is decent, but not the most extensive around. A free investment account at any major brokerage gives you access to all of these funds and more. However you would have to pay trade fees and commissions to buy and sell depending on the broker’s relationship to each fund family. At Stash, there are no add-on trading fees. Stash receives mixed reviews around the web based on its features and prices. Customers tend to be generally happy with the ease of investing and user friendly app experience. Investors with smaller accounts, however, are not fans of the fees. On an account with a $500 balance, you will pay $12 in fees per year, or 2.4%, just to keep the account open. A smaller account with a $100 balance pays the same $12 per year, but that is 12%, a massive fee in percentage terms. For new investors who don’t know anything and want a place to start out with a small portfolio, Stash is perfect for you. You can get started with as little as $5 and need little to no background on the stock market and mutual funds. Everything is there for you. However, experienced investors may find themselves frustrated with high fees and limited investment options. Over the course of many years, you may find the math shows you are better off with no monthly account fee and a trading commission. Or, if you open an account at Vanguard, Schwab, Fidelity, and others directly, you can invest in their funds with no trade fees or account fees. In summary, our Stash review is a positive one for new investors looking to get started, but it is not the best service for experienced or wealthy investors. If you are a new investor and want to get started, join Stash today with as little as $5. If you’re looking for a little hand-holding while you build a portfolio of ETFs, Stash may be a good fit. That kind of educational assistance may save money in the long run — you’ll avoid costly mistakes and learn how to manage your own portfolio. Stash Invest is a microsavings service geared toward beginning investors. Compared to its rivals, the service has more flexibility in choosing your investment options. However, it's too costly for smaller accounts, and all trades must be done via the smartphone app.